I purchased the first season of Telltale’s The Walking Dead series before knowing anything about what The Walking Dead really was. I hadn’t watched the show (with the exception of the pilot several years ago), and I certainly didn’t know anything about the comics. I picked up the game simply because I enjoyed story-driven decision-based games, and the game got almost unanimously positive reviews. So even though I don’t care for zombies, I would still presumably enjoy it. As it turns out, Season 1 took a very long time to start enjoying. It was basically my first real attempt at partaking in anything Walking Dead. So there was a learning curve, so to speak, regarding its style. 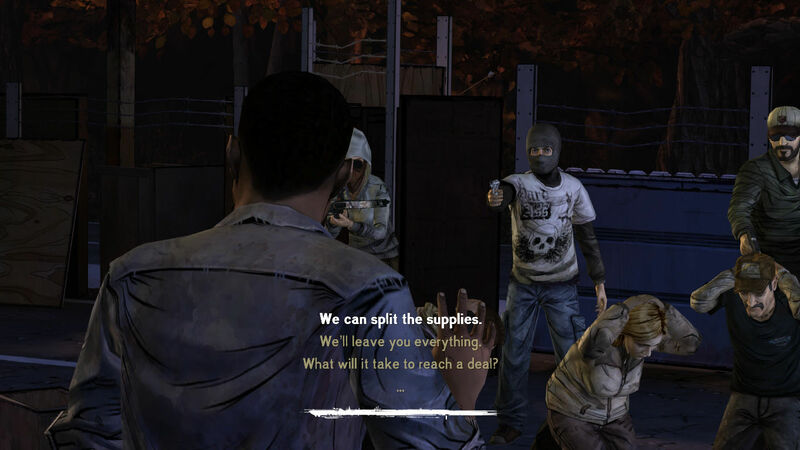 Not the style of the gameplay or graphics or anything, but the style of The Walking Dead universe… It took me many months to summon the enthusiasm to get through the first three episodes. I just wasn’t getting it, and the gameplay really bothered me. The whole gameplay presentation just seemed very clumsy. Playing on the PC, it was difficult to choose conversation options, because they are close together and they are not numbered. In order to do well in conversations, you had to quickly get good at skimming for the point of each option, then figuring out which number (1,2,3, or 4) it corresponds to, and then locate that number on the keyboard all before the timer runs out. I eventually hot-keyed the four numbers onto my mouse, but that only made it slightly less difficult. I would go into a panic trying to not screw up in conversations. The illustration style is comic-book like, clearly an homage to the Walking Dead comics, so that’s fine. But the animations following suit with cartoony-ness I didn’t like. It sort of took me away from the tension to see a character’s exaggerated gestures or expressions. The camera angles were a problem sometimes. Kind of similar to the early Silent Hill games, where the camera would be placed stationary in the environment and you had to walk the character around the best you could without seeing directly in front of you. The issue comes when you can’t see well enough to navigate around something, or you find it hard to notice all the interact-able items, or the view prevents you from having the clearest possible understanding of your environment. This happened a lot in this game. The story sometimes had me jumping through hoops that I found annoying. Like, there’s a couple times where you have options to try out and only one of them is right, and the game will make you exhaust all the others before the right one becomes available. It controls the experience too much, leaving not much room for inspired thinking. In one scene, I noticed a light coming from under a door and went to check it out, but I couldn’t interact with it, because there were still other things I had to interact with before my character could ‘notice’ it — even though I already noticed it. There’s a lot I didn’t like about the experience. Looking back on it, it’s possible that those issues were due to my inexperience and intolerance of the concept, but there were definitely some gameplay flaws as well. But in the end, it delivered an experience that did capitalize on the best of the what the concept has to offer. After completing Telltale’s first season, I promptly started watching the series to see how the concept was translated to live action. Six seasons later, I realize The Walking Dead is something completely special and one of the best pieces of entertainment available — but for totally different reasons than I would first assume. 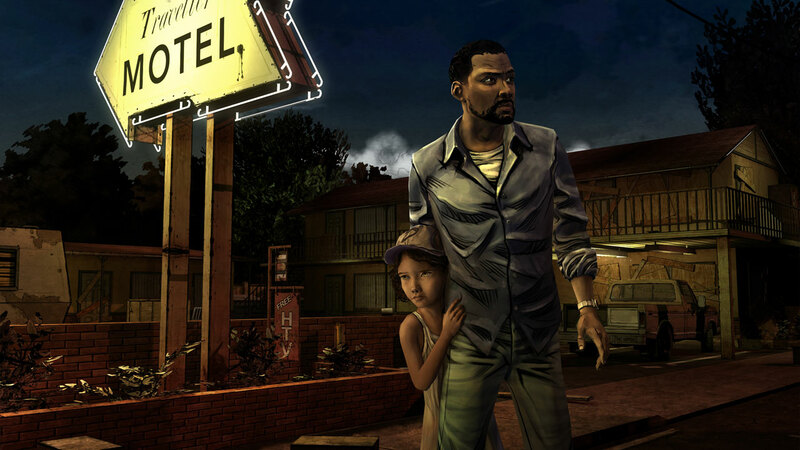 After that, I began the second season of the Telltale series. 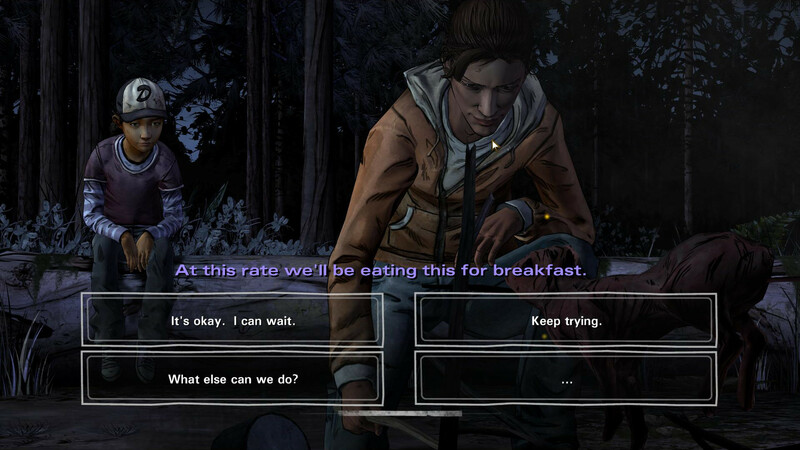 I feel like Telltale took note of everything imperfect about season 1 and fixed it. I have NONE of the complaints I had about the first one. The conversation options are much easier for PC players — the sentences are mostly short and housed in large clickable boxes making the selecting as easy as possible. As well, answers that are generally positive or negative tend to show up in the same quadrants, so you start to lean towards an area before the options even show up. I never felt the same clumsiness with the dialogue that I felt with the first one. I feel the animations were improved upon somewhat. Either that or I wasn’t bothered by them. I never noticed any instances where the camera bothered me either; every scene is pretty simple to navigate. Season 2 doesn’t have you do much walking and exploring either, which is a good thing. Exploring is not fun in this engine because controlling the character does not feel good. But you do little of that in season 2 — it mostly sticks to conversations and decision-making, which is the soul of the experience anyway. Season 2 seems to respect the player more, not controlling the experience so much, but letting you make your own experience as much as their tight framework would allow. And unlike the first season, I enjoyed the cast and story. 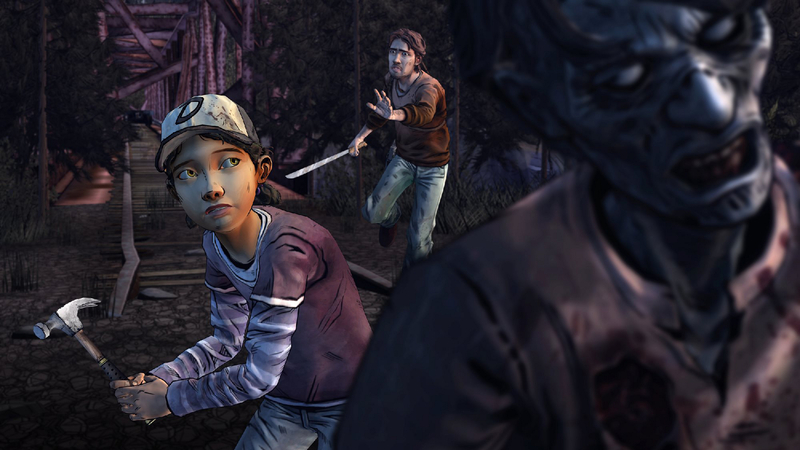 What made controlling Clem especially interesting is, you basically get to decide how much innocence she loses. Depending on your decisions, you can present your own version of Clem as hardened and wise, or resentful and angry, or childish and scared, or lonely and distant. Towards the end of the season, the writers made some amazingly satisfying decisions… and so did I! ;) I cried a few times. I loved season 2, and the final decision of the game made me think for hours past the credits. I might write a blog post specifically about that, because I have a lot of thoughts and opinions to share. Funny, I finished six seasons of the show just in time for season 7 to start, and I finished two seasons of the game just in time for season 3. Very excited for the next game, due out this November.